Are you a Black woman working in corporate/a professional Black woman making $50k or more but still living paycheck to paycheck? Are you over 30, and you’re wondering why you make good money but STILL don’t have enough to buy a house? Are you over 40, making great money, but living in dread and fear of losing your job because you have ABSOLUTELY no money saved up in an emergency fund? Are you a well-paid professional woman over 60 who wants to retire, but can’t yet, because you have BARELY any money saved (or worse yet - zero) for your soon-to-be retirement? On this webinar, I’ll teach you my strategy for how to save even if you have never had more than one month’s worth of emergency funds saved up. I’ll show you how - using my strategies - both me and my clients, have saved thousands for vacations, emergency funds, retirement and our many other dreams. How to Regularly Use Credit to Build an EXCELLENT Credit Score (without Falling into Debt)." Join me for the first ever episode of my LIVE Lunch & Learn “Money Mastery” series! Order lunch early - or brown bag it, get comfortable and pull up Facebook this Friday May 18th at 12 noon (EST). I’m going to share: “How to Regularly Use Credit to Build an EXCELLENT Credit Score (without Falling into Debt)." Are you often perplexed — and downright frustrated – by how your credit score changes so much from month to month? Is your score WAY lower than you want it to be (and holding you back from your dream job, dream home or dream car)? Credit scores are calculated using a few factors and can fluctuate monthly based on what we do with our credit. Many misconceptions exist around using credit. So, in this live training I’ll explain how it’s possible to use your credit regularly – even DAILY – to achieve an EXCELLENT credit score. No matter how much you use your card. My credit score has been in the EXCELLENT range for years. And I’ve helped multiple clients significantly increase their score in a few short months. I will show you one way to take greater control of your credit so that you can have access to all the best rates and financial opportunities that higher credit scores make possible! 1:1 COACHING PROGRAM Now open! So, I’m very excited to announce that I have opened up new coaching programs for women this month! Ladies, if you have been thinking about getting personal coaching to help you get out of debt, save money, or get past those blocks you keep having, I’d love to see how I can help you. If you’re interested in seeing if we’d be a good fit, click here to schedule your FREE 60 minute Money Mastery Strategy Call! 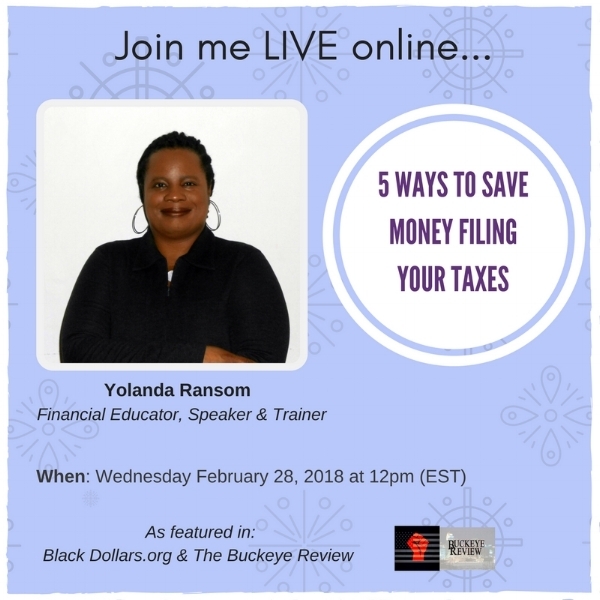 Join me LIVE over lunch to find out 5 ways to save bunches of money filing your tax return this year. In this FREE live training, you'll learn about many filing options available, both in-person and online. There will be a live Q&A following the training. Bring your tax filing questions to ask me "in person." Register at https://buff.ly/2CdIfc5 to attend and to be reminded when I go live on Wednesday February 28, 2018 at 12pm EST. *Please Note: This training will provide information about where to file your taxes and general tax filing tips. I am not a Tax Preparer and cannot advise on specific tax filing situations. Please check with your Tax Preparer or Attorney for guidance on how to submit your specific filing. 2017 3-DAY xmas SALE !! 2018 is coming soon…(in a few short days!). Start the year off right by getting ready with dreams, goals and action steps all written down! Give YOURSELF the gift of success with a “My Abundant Money Book” for $13.97!! They're on SALE for OVER 35% off. Shipping AND tax is included! Plus, get a FREE surprise bonus with your purchase. 2017 CYBER MONDAY SALE EVENT!! This year, don’t forget to put YOURSELF on your gift list. Give yourself the gift of a confident, focused and prosperous start to 2018. Get a 90 Minute “Amp Up Your Savings” Coaching session at 50% OFF! This ONE DAY sale is on Cyber Monday November 27, 2017. Don’t miss it! Catch the Replay of How to Save The money You Need for Your Dream (And Not End Up Broke) here! Join me LIVE, where I'll bring my 3-Part live stream series together into one full training! Are your tired of trying to save money for your dreams and failing over and over? If you look at your savings from a year ago, are they still in the same place? Or worse yet, are they at ZERO? Apps that “save” for you. You’re STILL not saving the money for your dreams. Do you feel uneasy, worried and frightened about your future because of your lack of savings? The same was true for me years ago. I failed at savings too, until I figured out this system. With it, I saved more than $12,000 in my emergency fund. And over $50,000 for my retirement. Before working with me, many of my clients failed at saving too. One of my middle-aged clients came to me with ZERO savings. Nothing worked for him until he used my system. He now has saved thousands for emergencies. And over $20,000 for his retirement. I’m able to help my clients be successful because I’ve been where they are, and I’ve done it. I know how to help them find the money to save for their dreams. And I want to help you succeed in saving for your dreams too, so I’m hosting a live training. In it, I’m going to show you my exact method for saving thousands for your dreams right away. Do you want to save up money for the life you dream of? I'm hosting a 3-part series to help you just do that. Click here for INSTANT access to the series. Plus, get a FREE gift. Each part of this value-packed series will show you how to successfully save money for your dreams with the same methods that I have used with my coaching clients. Also, Follow/Like me on Facebook at Yolanda Ransom Consulting to get notified whenever I go live! "5 Ways to Improve Your $ Flow in 30 days!" Are you struggling to get your money flow under control? I'll show you 5 steps to get control of your finances so that you can begin achieving your money goals. Join me in this webinar celebrating the official launch of Improve Your Finances! o A complimentary new Tip Sheet full of more ways to Improve Your $ Game! o A special offer celebrating the August launch of Improve Your Finances!